Not that I'm complaining, you know, because I'm so excited for some beauty experiments! I purchased this box back in September for $35.99 (that includes shipping). I had purchased it hoping that it would be like the amazing Earth and Sea box, which I missed. While it's not the Earth and Sea box, I'm still really happy with it, let's dig in and see why! Product Description: An Amazon white clay pack used to cleanse sebum and skin impurities in pores as well as tighten enlarged pores. It contains organic Aloe Vera extracts to soothe and moisturize the skin. This White Clay pack is a gentle wash off pack that will leave the skin feeling soft and perfect. To apply, spread the clay pack over cleansed face. Leave it on for 10 minutes then gently wash off with lukewarm water. It can be used 1 to 2 times a week. My Thoughts: After the sleeping mask fiasco, I patch test everything. EVERYTHING. I don't want a repeat of what happened, since my skin is currently healing from a recent breakout. With all my recent purchases of skincare products, I found that I have a soft spot of clay masks. Especially ones that can clean out pores, tighten them, and has sebum control. I was glad that this mask didn't break me out when I patch tested it. Since the only White Clay pack I've tried was Laneige's, I'm super excited to see how this one will work out and I'll be comparing it to the Innifree Super Jeju Volcanic Clay Mask. Product Descriptions: A nourishing and moisturizing cream used to relive and firm up dry and dull complexion. 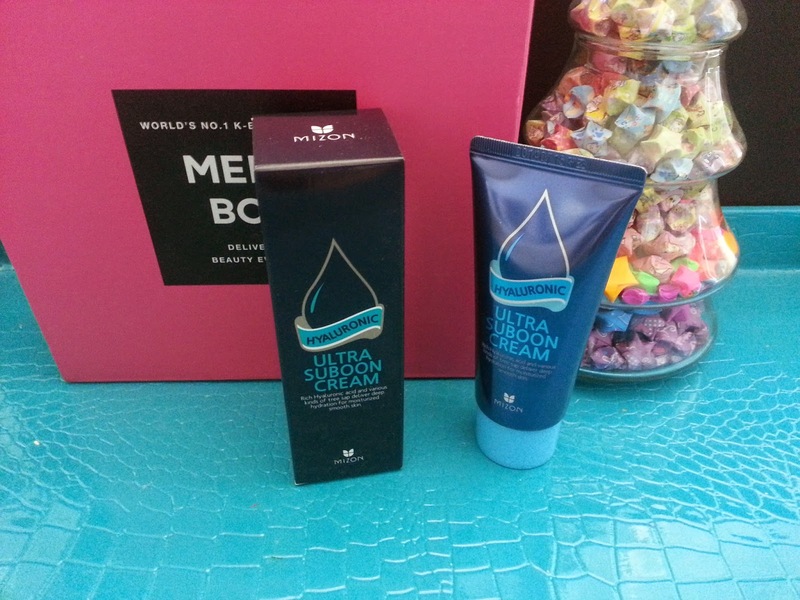 This Hyaluronic Ultra Suboon Cream contains over 30% of pure hyaluronic acid, aka moisture magnet. It works to effectively lock in moisture and nutrition. It also contains a variety of natural ingredients and ceramide to soothe sensitive and stimulated skin. The formula is gentle as well. To use, apply the cream to clean face as the last step in the skincare routine. My Thoughts: I'll be honest, I haven't tried this yet. I've got so much creams to go through that this one might be traded or gifted out. It sounds pretty promising though and I've yet to have a complaint with a Mizon skincare product. I've also tried other products with hyaluronic acid and ceramide in them, all of which I liked. Product Descriptions: Grinif Collagen Aqua Peeling Gel works to remove dead skin cells without drying, irritating, or stimulating the skin. Its formula contains multi-action enzymes and cellulose to effectively 'peel' the skin and uncover a smooth and soft complexion. It can also remove impurities, unclog pores and provide a youthful radiant look. 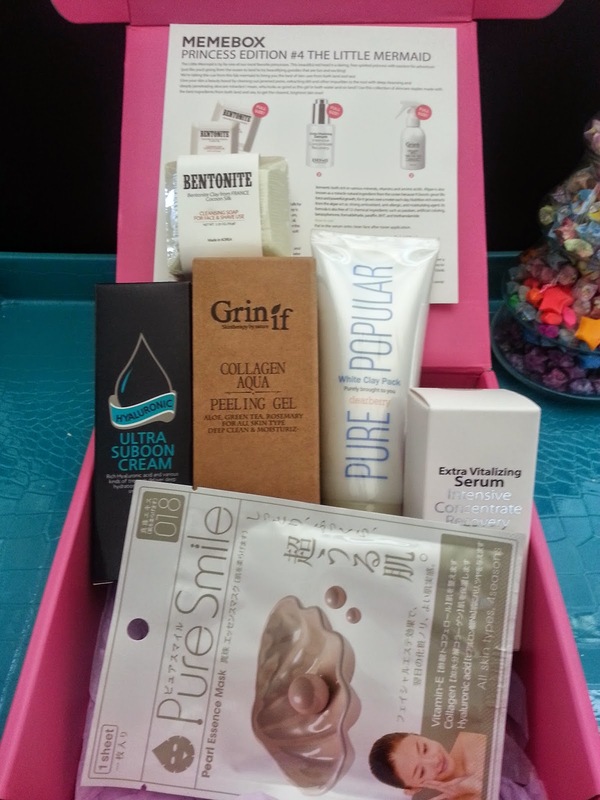 My Thoughts: My first peeling gel was Cure, a Japanese product that I love to this day. It's on the expensive side but it really works without irritating my skin. This Grinif product sounds like a cheaper version of Cure, which I will be patch testing to see how well it works. I haven't used a peeling gel in a spray bottle before, so this ought to be interesting. 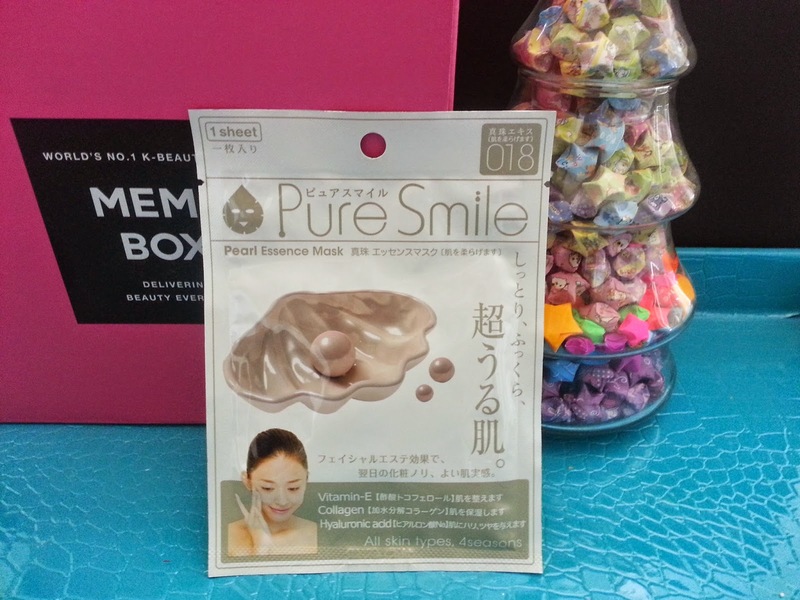 Product Description: Pamper the skin with an Pearl essential sheet mask. 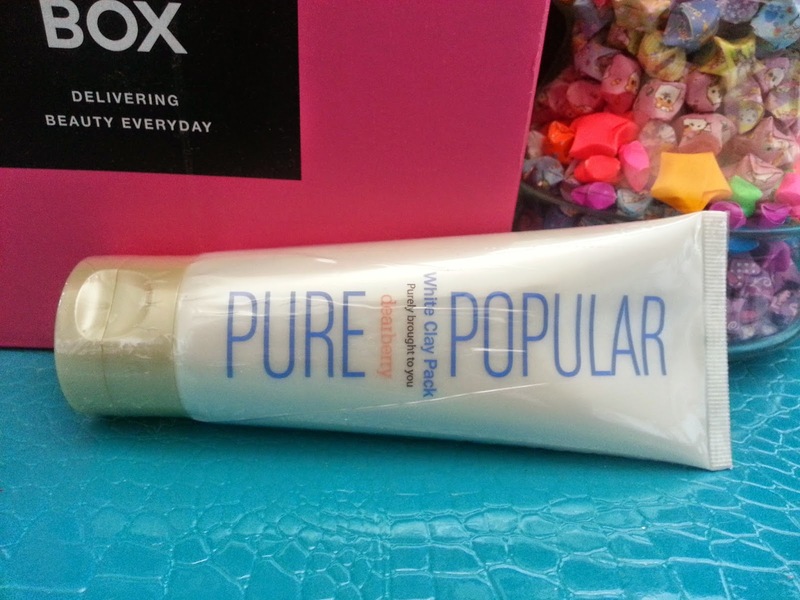 This mask is formulated with hyaluronic acid, Vitamin E, collagen, and pearl extracts. To use, apply the sheet mask to face and leave it on for 15 to 20 minutes, then remove and pat in any remaining essence. My Thoughts: I've tried Pure Smile sheet masks before and while they are not my favorite, they are so-so. There were 2 kinds of sheet mask you could have gotten in the Little Mermaid box and the one I got is the pearl one. The other one is the seaweed one. I've not tried the pearl one yet but I'm sure I'll eventually use it. Product Descriptions: Formulated with algae extracts and galactomyces ferments, which are rich in a variety of minerals, vitamins, and amino acids. Algae is know as a miracle natural ingredient because it's nutrition rich extracts act as a strong antioxidant, anti-allergy and moisturing agent. To apply, take an appropriate amount and pat gently onto clean face after applying toner. 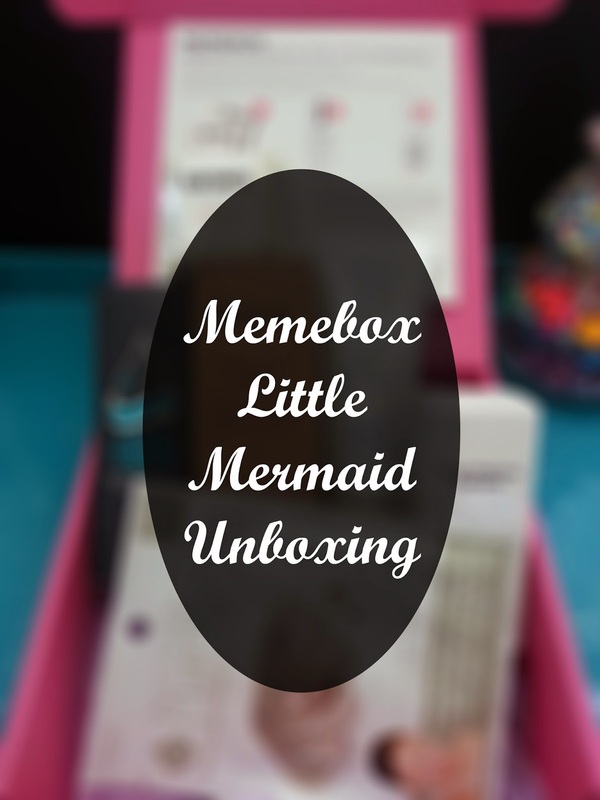 My Thoughts: I started purchasing boxes from Memebox because I wanted to try products from known and unknown brands that I might not otherwise buy on a normal basis. This product would be a perfect example of that. 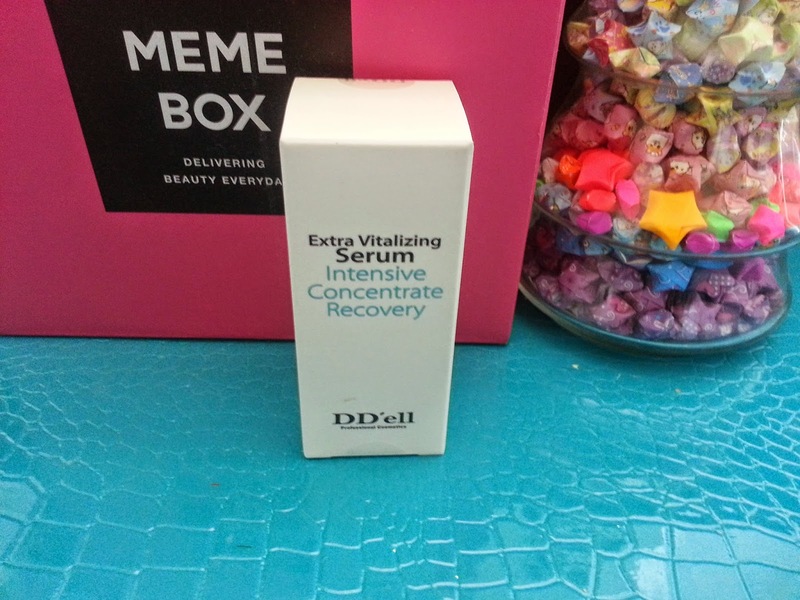 I've never heard of the DD'ell brand until now and I'm glad I did. While I'm in love with my Green Tea Seed serum from Innisfree right now, so I won't be trying this anytime soon, I'm still really excited for this serum. It sounds like it's got some amazing properties for the skin and I can't wait to patch test it to see if I can use it. Product Description: A bar soap that brings together 2 unlikely ingredients to create one amazing product. 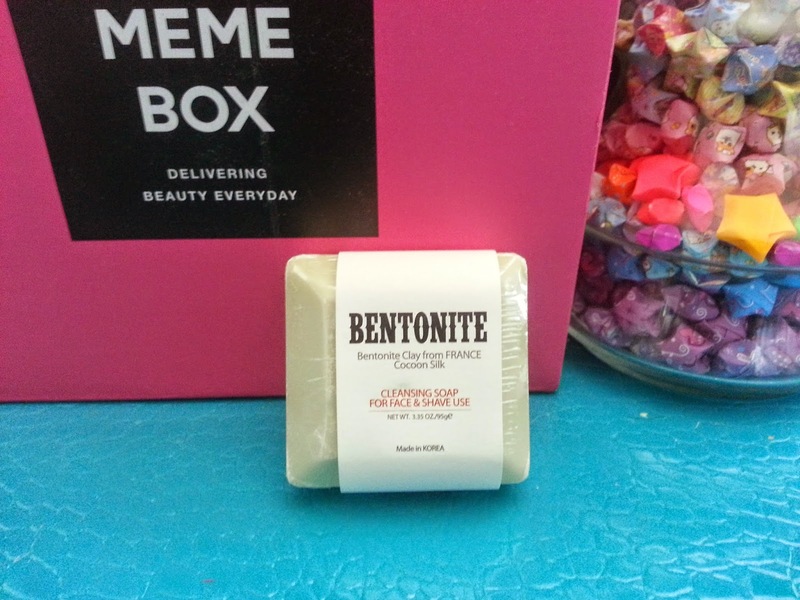 The Bentonite in the bar soap is a clay, packed with over 66 different kinds of natural minerals such as calcium, germanium, and selenium which works together to gently remove impurities, oil and dead skin cells from the skin. The cocoon silk is known as an ingredient similar to our skin's innate protein. Plus it's great for cleaning pores. Together, the soap will leave the skin soft and moist while clearing away any impurities. My Thoughts: I'm not a big fan of bar soap, so when I first saw this product in the box I wasn't quite happy. However, after reading more on it and learning about its Bentonite clay and cocoon silk ingredients, I'm much more excited for it. While I won't be using it in its soap form, a recent skincare recipe I tried has got me thinking of way I can use this Pureplus+ Bentonite Cleansing soap. Look out for the in-depth review of the product and recipe in the future! Overall, this box turned out to be an amazing box of goodies. The quality of products is definitely great and the monetary value is there as well. I can see myself using just about all the products in this box. While it's not like the Earth and Sea box that I missed, to me, it's just as good.